I am making Cuban Picadillo, a mild Cuban chili. Chili calls for beans and rice. I have made Mexican black beans and rice before, but each country—village?—mother?—has their own take on this dish. This is my take on Cuban Moors and Christians. Note: Many recipes for this dish call for added pork—of one form or another. My main dish is very heavy on the meat, so I thought to make this dish a bit more vegetarian. 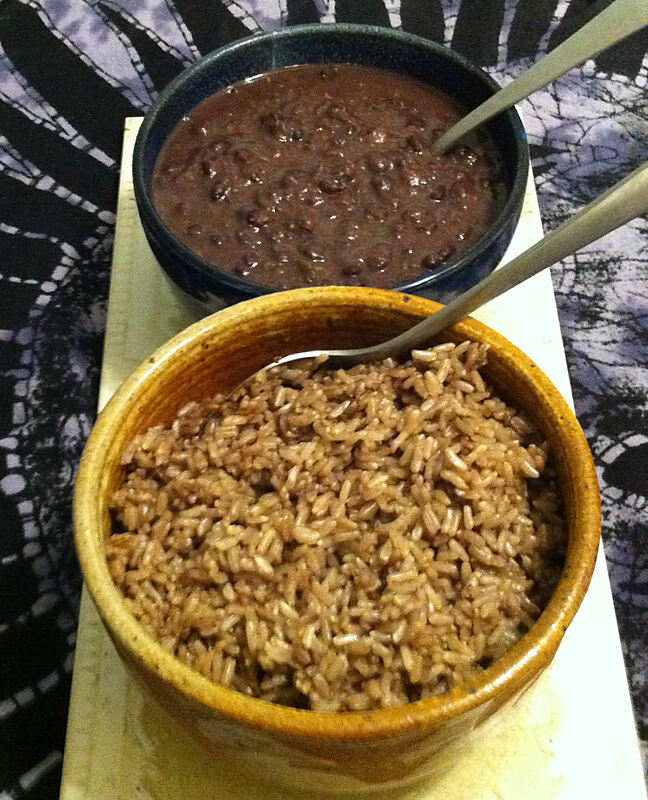 Traditionally with this dish, the beans and rice are cooked and served separately. Some of the bean liquid is used in making the rice, but they are not mixed until they are put on the individual’s plate. If you cook the beans and rice together it is an African influenced congri. Note: You should start the final cooking of the beans at least two hours before dinner, because you will be using some of the bean liquid to cook the rice. 1. Sort and rinse the beans and put them in a medium/large pot with 2 ½ cups of water and stir in half a teaspoon of salt. 2. Bring the pot to a boil, cover and remove the pot from the heat. 3. Let the beans rest for at least one hour. Tip: This is the quick soak method—it saves on both time and energy. 4. Drain the beans, but reserve the liquid. Tip: Many cooks discard the soaking liquid, but I do not. You lose too much of the beans color and vitamins if you discard the liquid. It is supposed to be Moros, not gray-os. 5. Rinse the pot, add the olive oil and heat it over a medium high heat. 6. Sauté the onions with the remaining salt for five minutes until starting to pick up some color. 7. Add the bell peppers and half of the Jalapeño pepper to the onion, and continue sautéing for three more minutes, until the vegetables are soft. 8. Add the broth and black pepper to the pot. 9. Pour the soaking liquid into a measuring cup and add enough water to make one cup. Add this to the beans. Tip: It is OK if there is a little extra. Much of the excess liquid will be used in making the rice. 10. Bring the pot to a boil, cover and reduce the heat. Simmer the beans for 50 minutes, until the beans are almost tender. 11. Remove the pot from the heat and strain off one cup of the pot liquid through a sieve. 12. Stir in the remaining Jalapeño pepper and set the beans aside, off the heat. 13. Rinse the rice and put it in a second pot or rice cooker. Note: The traditional rice for this dish is long grain white rice, but with my diabetes Jan is trying to get me to use more whole grains. 14. Add the cup of bean liquid and stir in a second cup of water. Tip: If the beans still seem a bit soupy after you have removed one cup of liquid, feel free to remove more bean liquid and reduce the amount of water added to the rice. The total just has to come to two cups. 15. Cook the rice until tender, about 20-30 minutes. Tip: I prefer to use a rice cooker, because you simple push the button and walk away. Perfect rice every time. 16. When the rice is almost done, reheat the beans and mash enough beans against the side of the pot to thicken the remaining liquid. 17. Fluff the rice and place it in a serving bowl. 18. Stir the lime juice into the beans and transfer the beans to a separate serving bowl. 19. Diners serve themselves a bed of rice and top it with the beans. Tip: Serve extra fresh lime juice and hot sauce on the side to be added to taste.